I have so many guilty pleasures that I'm in a permanent state of mortification, and one of my pleasures is a good old-fashioned dungeon crawl. It's not because I love killing monsters and collecting treasures; the actual BULK of a dungeon crawl game is incidental to me. What I REALLY like to do is to EXPLORE. 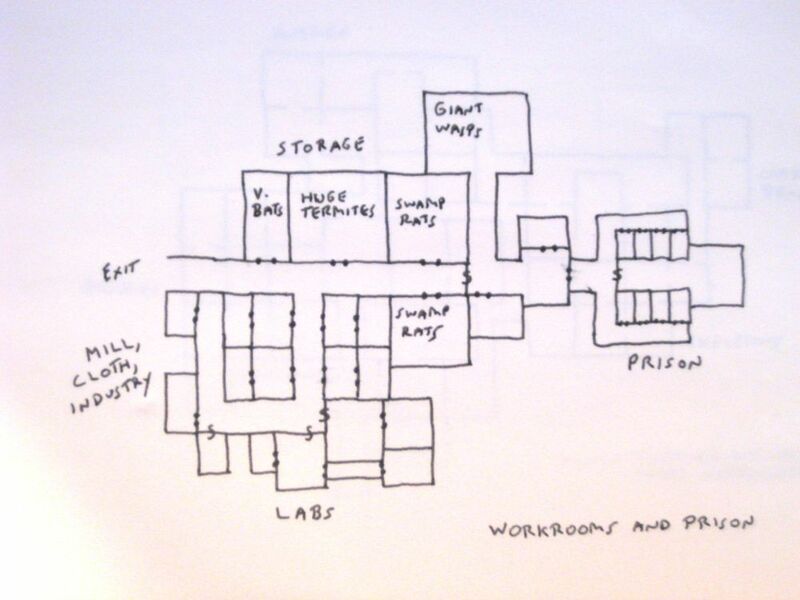 I've always gotten a thrill out of mazes, tunnels, and imaginary digital worlds. Unfortunately there are few games that are simply about exploring...pissy monsters are always attacking you and you have to solve anachronous "eight queens" puzzles at every second step. I'm of the opinion that the world (the real one) is waiting for a computer simulation of a rich landscape that doesn't necessarily have anybody else in it. The fact that I'd enjoy such a thing is creepy, really. ...the Dunjonquest series, considered to be the first dungeon crawls for the 8-bit home computers. Originally developed by Jon Freeman (who is most idolized these days as being one of the creators of Archon) for his fledgling Automated Simulations company (likewise most idolized for later becoming Epyx), these games were all about wandering around mazes, killing monsters, raising your stats, collecting treasures, and running from Antmen who apparently used a vanilla-scented body lotion. Originally written in BASIC in 1979, the first games required a great deal of patience and imagination, and the subsequent games -- with the exception of "Gateway to Apshai," a very different arcade-style adventure -- used the same engine. 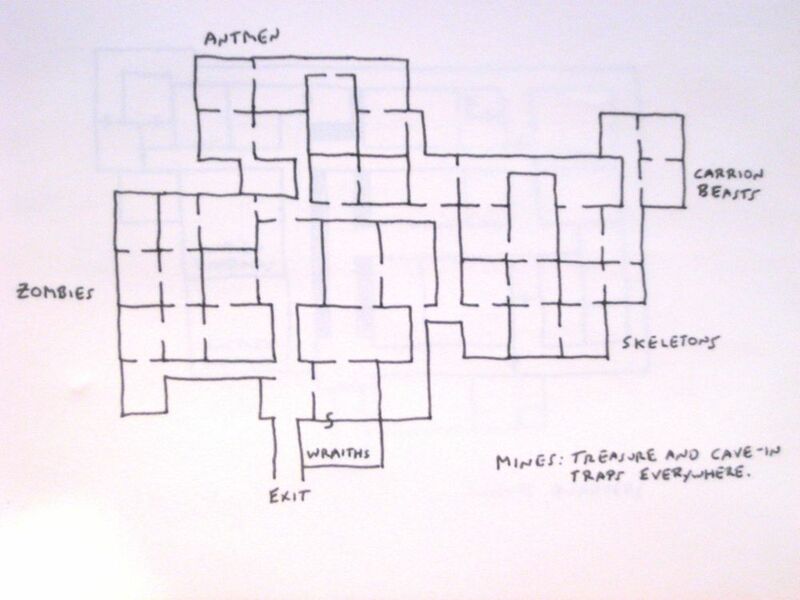 Even when the Apshai games were eventually released as a re-written, integrated, machine-language "Temple of Apshai Trilogy" -- the way most people remember them -- you still needed to shuffle your little character along featureless corridors, bumping into walls and slaying barely-animated 4-colour monsters. So Dunjonquest games don't have a lot of appeal to gamers these days, and they've slowly faded away from the eyes of even the most nostalgic 8-bit fans. I'm happy to say I'm not alone in my love of these games, and I've been collaborating with Robinson Mason -- and scrounging the darkest corners of the internet -- to reclaim the programs. And not just the programs, but also the even more rare "Books of Lore" which are both essential for play and a delight to read. While my compatriot tirelessly unearths more of the games and materials, I've been concentrating on reverse-engineering the BASIC code and mapping all the levels. I've discovered some interesting things buried in the convoluted rats-nest of oddly-ported BASIC, but that will come later. 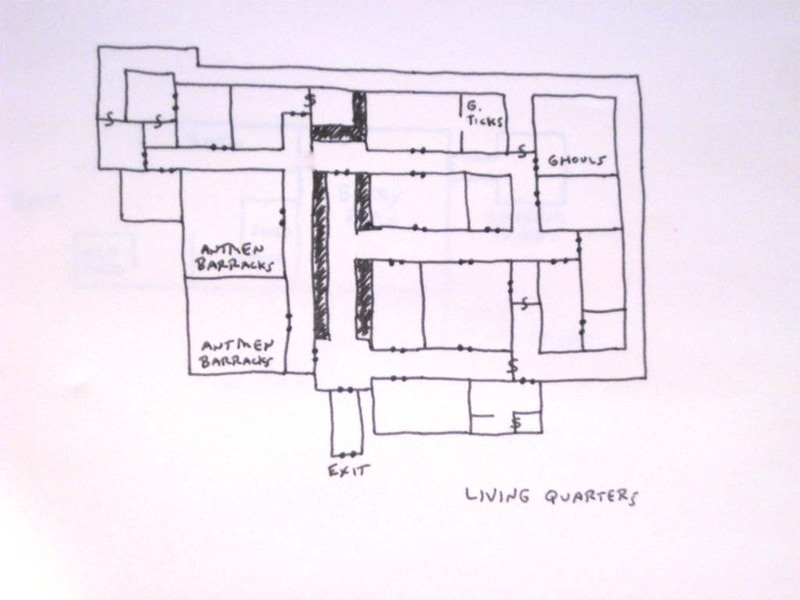 Right now, here are maps for the four levels of the first game, "Temple of Apshai." 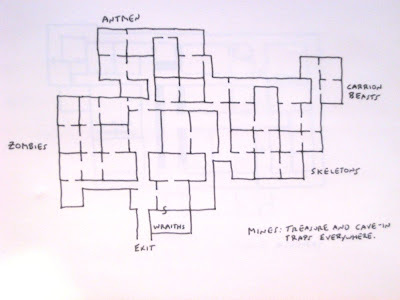 I decided not to include room numbers, traps, or treasures -- that would not only clutter up my tiny drawings but would also spoil more of the game. And I make no claims to the 100% accuracy of these maps; they are complete and fully-connected, but their proportions may be slightly off. Click on an image to see a larger version. 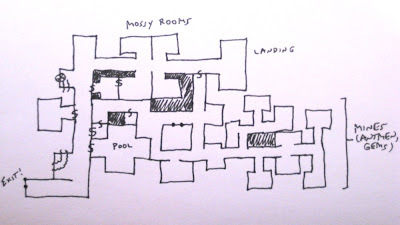 The maps for the next game ("Upper Reaches of Apshai") are coming soon (along with playing tips), and I expect there'll be a resource site starting up eventually. Until then, spare a thought to all those digital worlds that are locked up in decaying floppy disks in attics and basements, and consider rescuing them for one last time. Great! I'll have to post a link up on my blog. Hey -- thanks for posting this! 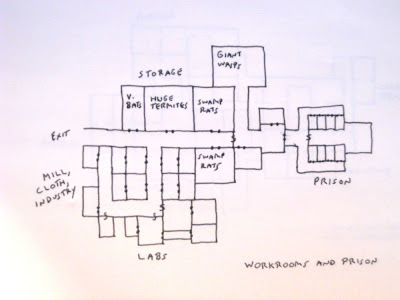 Been kicking around an idea to write up a D&D adventure based on this old game and the lack of a map (& the time/energy to find & run a port to map it myself) was a huge hurdle. BITD, I don't think I ever made it thru this one. 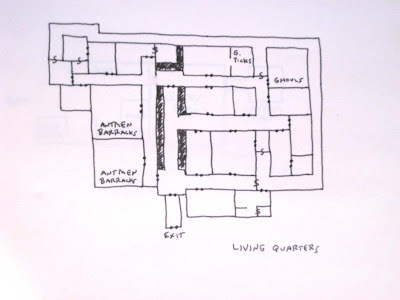 I noticed that you have made maps of "Upper Reaches of Apshai," but I'm currently working on those maps now. 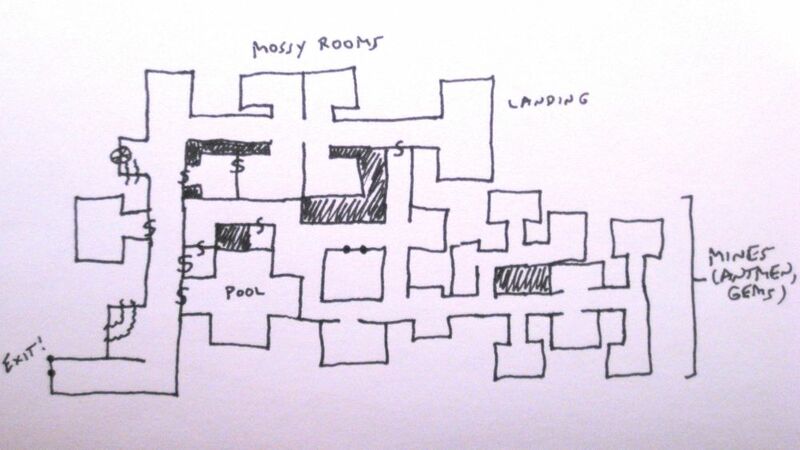 From your comments on the "Upper Reaches" page, it looks as though mapping those levels with screenshots will be much more difficult (or maybe not possible at all since rooms overlap). Ballyalley, you're doing a great job on the maps over at the forum! I think we feel exactly the same way about mapping these games: it's most of the fun, and since other people might NOT enjoy mapping then they might as well have maps to work from. Everybody wins! Except the Antmen. You're right, the rest of the games will be more difficult to do just from screenshots. Some areas just don't match up -- overlapping other areas -- and there are lots of deliberate misdirections. I'm sure you'll find a way, though! I mapped the first three levels of Hellfire Warrior, but I ran out of steam halfway through the fourth, and I never posted those maps. If you want to reveal the room numbers for the maps that don't provide any, I posted steps for hacking the games elsewhere in this blog. Regarding manuals: W. Robinson Mason III (see first comment in this thread) and I went on a huge search last year, and managed to find almost everything Dunjonquest-related. He was the real sleuth so if you're looking for something specific, you might contact him through is blog. I do have all the manuals in digital format, but I think we were only ever able to turn up a TRS-80 version of "Keys of Acheron," and I seem to remember he was having trouble with "Sorcerer of Siva." Thanks for the compliments on the maps. I've been working on mapping "Upper Reaches" from the screenshots. I'm only on level one, "The Innkeeper's Backyard." The level is extremely short! I'm surprisingly amused by the silliness of the game. I didn't think that I'd care for it as much. I guess being attacked by a Housewife and a Tomato are just funny enough to make me laugh. When areas of the initial maps I was making didn't match up exactly in Temple of Apshai I was a bit surprised. I thought that maybe I had made a small error someplace. Then, when I mapped the Atari version and it matched exactly right down to the pixel, I was relieved. BTW-- There are a couple of small errors on my C64 maps, but they are SO small that I'm just leaving them there. The Atari versions are considered the definitive versions. Room 30 on level 2 of Temple of Apshai is one block longer and doesn't fit on both the C64 and Atari versions of the game. I had to shorten a room below it to make it fit. I'm sure that no one would ever know unless I mentioned it. I'm glad to hear that some areas don't match up on the later dungeons. Figuring-out how to map something like that should be fun. I'm glad to know ahead of time that it was done on purpose. Thanks for the offer of a way to reveal the room numbers. If I need it, then I'll let you know. As for manuals, since I'm currently working on "Upper Reaches," I'd like a manual for that game. The Trilogy's manual seems short on lore-- plus I always admire the artwork. Ballyalley, don't worry, the "Killer Tomatoes" humour of the first "Upper Reaches" level doesn't extend to the other levels, if I remember correctly. Dr. Seuss and Flit: "Darker Seuss"
"Boils All Over My Back!"